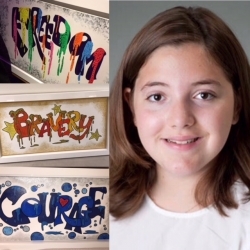 As I approach my Bat Mitzvah I wanted to do something special to help other children, less fortunate than me. When I went to Israel with my family I visited a very special place. The new Shalva National Center is in the heart of Jerusalem and every day around 1,000 children with disabilities come to the Center to get therapies they need and join different programs. The Center is beautiful, with bright colours and butterflies all around, has everything you can imagine to help the babies and children with disabilities have the best chance in life. There is a group of children in the After School programme, called Ofek, who come to Shalva every day and spend the afternoon at Shalva, doing different activities like music, art, swimming, pet therapy, judo, basketball and football. There are ten children in the Ofek group who are also going to be turning 12 or 13 this year and I want to make sure they get a Bar/Bat Mitzvah program and celebration that they will remember. I have decided to do everything I can to raise the money to give them a meaningful celebration, so they can join me in my journey to taking on more responsibility and being an adult and part of the community. I love to draw and paint and in order to raise the money needed I have created some paintings that I feel represent the love and hope that I saw throughout the Shalva Center. Elena Gabay 1000 GBP Well done Lucy! Rob Suss 100 GBP Well done Lucy !